Did you see my first post about Rocking Horse Ranch? I’m going in chronological order here, so while you could definitely just jump right in, you’d be missing some of my supercute pictures and also a link to a video of me riding a horse! Anyway, after a great first day, we went to the later seating for dinner (7:30PM). A note about the food: breakfast and lunch are both buffets, and dinner is waiter service. All three meals are served family style, so you share a table with other guests – it was really nice getting to know new people, and many of the families we spoke to had been visiting the ranch for many years. The food was not necessarily gourmet, but there was plenty of it, and enough options to satisfy any picky eater – including vegetarian entrees at every meal. They also said that if there were any special accommodations necessary that you could speak to the chef and they would help you out. …but we’d had a very full day of adventures, so I didn’t quite make it! Mommy and Daddy enjoyed the entertainment for the evening (Bubble Mania), and I’m sure I would have also, but I was totally tuckered from our day. Tuesday was just as much fun as Monday. Originally, we were supposed to be staying for 2 nights, but we couldn’t make it up on Sunday because of Hurricane Irene and Mommy had a prior commitment on Wednesday so we couldn’t just switch our reservation. Rocking Horse was really nice about applying our deposit to the single night we stayed so we didn’t lose any money or anything. We did, sadly, lose a whole day, though because even though check-out time is noon, you can stay and use the facilities all day. We actually stayed until about 7:30PM because we wanted to fit in workouts for horse riding as much as possible. It was so much fun, we can’t wait to be back next year! …and a ride on a pretend horsie as well. Mommy and Daddy had signed up for the 11:30 trail ride, so after my equestrian adventures, we headed over to Fort Tiny. Fort Tiny is available for kids that are too young to participate in Rocking Horse’s Day Camp. It’s free for kids over 2, but us younger guys are $10 an hour. You know Mommy stays home with me and I have only stayed with people other than family members twice EVER: once with Michele and Max while Mommy had errands to run, and once with Mommy’s friend Julie who she has known since first grade. So leaving me in the day care center for an hour while they went horseback riding? That was a Big Deal. The ladies in Fort Tiny were really nice, though, and there were a ton of fun toys! Mommy was impressed that they took the kids out on walks around the grounds, too, and the kids to staff ratio was 3:1 (at most – there were no other kids there when I got there, so I got both of the ladies in the center to myself!). I was having so much fun playing that I hardly even noticed Mommy and Daddy leaving, and I had a great time the whole time they were gone! Mommy and Daddy had a great time on their trail ride, too. Mommy was nervous because she’s never really gone horseback riding, but Sundance (her horse) was really calm and after a few minutes Mommy relaxed and enjoyed her ride. Daddy rode Bear and thought he was really nice, too. After that we headed to the front driveway to watch the horses walk home for the night. Rocking Horse Ranch has 113 horses and, unless they are sick or injured, they all walk across the street to their pasture for the evenings. It’s really neat; they go in groups of about 25 horses, and they mostly just walk themselves home! 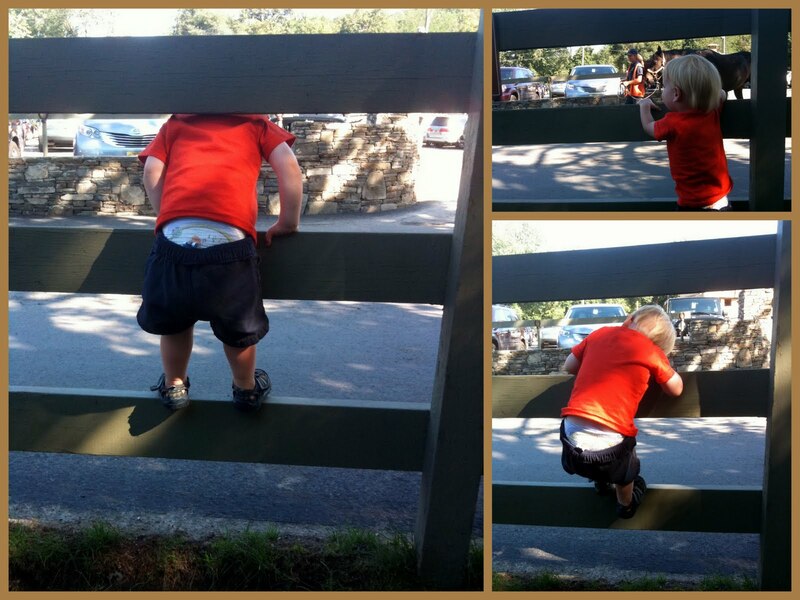 I took the opportunity while we were waiting for the horses to show off my fence climbing skillz. Mommy did *not* know I could do that! After the horse parade, we decided to head back to the pool for a while before the stable tour. Even though we had already checked out, we had kept our pool stuff separate and were able to change in the locker rooms. We had a really nice afternoon and I made Daddy go on the little slide another 753 times before we changed and headed up to the stable tour. Steven headed the stable tour and told us all about the daily care of the horses. We also got to meet Root Beer, the one-year-old baby horse – I’m older than her! 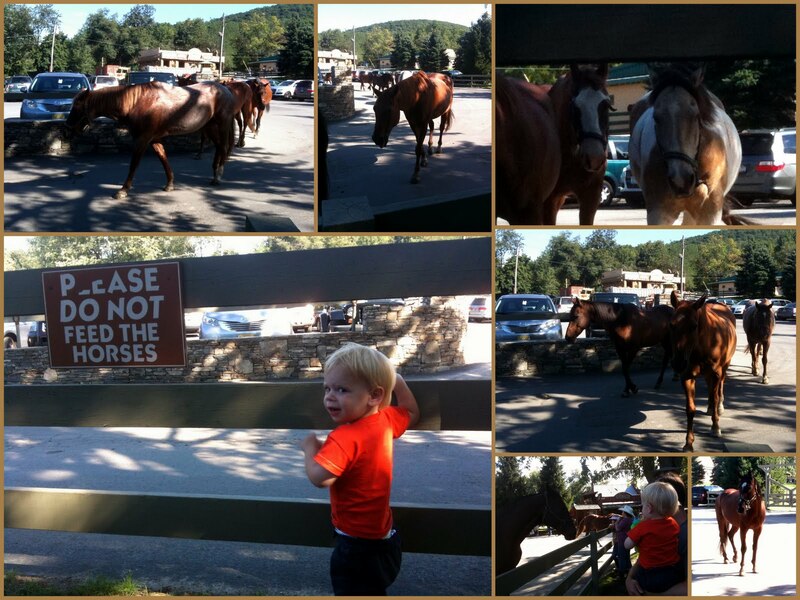 My friends at Rocking Horse Ranch offered Mommy and Daddy and me a discounted rate for our stay. I did not promise to say nice things about them, nor did they ask me to – and if they had? That’s no guarantee I would have anyway. I am 2 and v-e-r-y contrary. Rocking Horse Ranch looks like so much fun!! Can't wait to take Little L. there someday! My girls are obsessed with horses…they would love this!!! I wish there was something similiar in our state.